In recent days, much has been written about Malala Yousafzai – the 14-year-old Pakistani girl shot in the head by the Taliban. But in 2008, when the Taliban imposed a ban on girls’ education in Pakistan’s Swat Valley, no-one had heard of the schoolgirl from Mingora. Often in conflicts, news coverage focuses on bombing and killings. The stories of those caught up in violence are lost. So our colleagues at BBC Urdu set out to capture the impact the conflict in Swat was having on the pupils involved – their thoughts about their future, and how they were dealing with their day-to-day life. 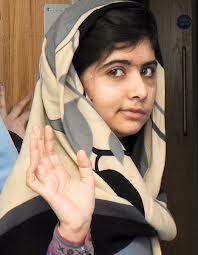 BBC Urdu reporters made contact with teachers at a number of schools, including Malala’s father, Ziauddin Yousufzai. He ran a school in Mingora, and suggested that his own daughter could write a regular diary. But in order to reduce the risk to Malala, we agreed she would write under a pseudonym, Gul Makai. Malala’s diaries were published for 10 weeks. The diaries stopped when Malala and her family left the Swat valley before the launch of a military operation in May 2009. That was end of her association with the BBC. Malala began appearing on Pakistani TV news channels under her real identity, named as the girl behind the BBC Urdu blog. She was awarded a national peace prize by the Pakistani government, nominated for an international award and made several public appearances as a campaigner for girls’ rights to education. Her fame spread far beyond Pakistan, as she stared in a documentary filmed by the The New York Times. The BBC is incredibly proud of its association with Pakistan. BBC Urdu began broadcasting in April 1949, less than two years after the country’s independence. Today, the BBC is still one of the most trusted news sources in Pakistan – precisely because we’re committed to telling all sides of any story. Malala’s is an important voice in the debate about Pakistan’s future. When the Taliban became the de-facto rulers of Pakistan’s Swat region between 2003 and 2009, they ordered schools to close as part of an edict banning girls’ education. At the time, Malala Yousafzai was just 11, but she spoke out through an anonymous diary on BBC Urdu’s website, and later featured in two New York Times documentaries. In recognition of her courage, she was recently short-listed for the International Children Peace Prize, awarded by the Dutch organisation KidsRights. Now aged 13, she spoke to the BBC about her activism.